This might be the hardest nature quiz ever – I don’t think I would’ve ever figured out what this was had I not found what I did next to it. I found it on my recent trip to look for Cicindela scutellaris (festive tiger beetle) in southeastern Missouri. Of course, now knowing what it is, the image does seem to provide enough clues about its identity – perhaps some crack naturalist will figure it out. I’ll provide the answer with additional photos tomorrow. This entry was posted in Diptera, Oestridae and tagged bot flies, entomology, flies, immatures, insects, Missouri, nature, parasitism, quiz, science. Bookmark the permalink. Looks to me like the abdomen from a pupa of a large silkmoth, like a cecropia, maybe. Wow – impressive! Okay smarty pants, which one? I’ll say Horse Bot, perhaps it was found nex to a large dry pie? You’ve gotten closer than anybody, but think smaller! It’s a one of those things, you know a…. It looks like an insect abdomen of some sort, but that wouldn’t confuse an entomologist, would it? Perhaps a plant or cactus bud? Insect abdomen is more on the right track than plant bud, but not quite. Why am I thinking scorpion? Well, that would put you in the right Kingdom and Phylum. It reminds me of the mummified empty sphinx moth caterpillar shells I found back in the winter, only slightly different. Hmmm, my first thought is a pupa, but, honestly, I haven’t a clue. Yet, I feel I should know. Must take an insect course, soon. First thoughts are the best choice when you haven’t a clue! Yes, the empty pupa of a… oh darn, so close! Could be right, it didn’t melt in my hand when I picked it up. 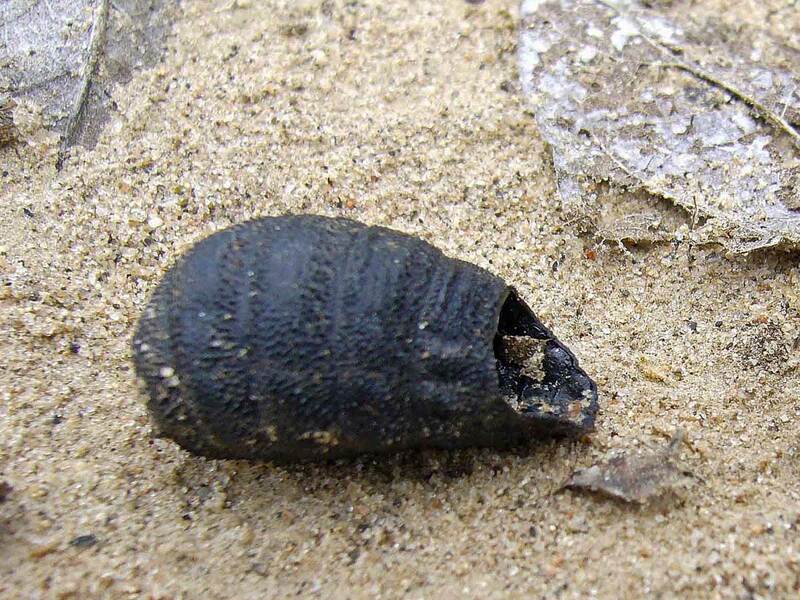 Considering it was taken when you where hunting for a certain little beetle, I would say a tiger beetle pupal case. I can also safely say it is not, as I originally thought, a miniature elephant seal nose. Not too close with your first statement, but your second one is spot on! Now I can’t wait to see the answer Ted, you sure have gripped my curiosity on this one!! You’re just jealous because I got a photo of C. longilabris. Just a matter of time, my friend! The outline is quite similar to that of an Oestridae larvae thus the pupae and emergence. Odd that it is on the soil surface. Well I’m sure you must have the adult and now it’s wing venation time! Unfamiliar with the Missouri fauna but may be of the genus Cephenemyia (cervids), Oestrus (sheep +) or Hypoderma (cattle), or Cuterebra (terrestrial rodents). Cuterebra sp. then? If not, I am unsure and would need the adult. Yep – I’m impressed! We’ll discuss possible species ID when I get the next set of photos posted. Thanks for playing!